But what does legalization mean for the Canadian economy? How much is the market potentially worth? “The federal legalization of both medical and recreational cannabis has positioned Canada to be the global leader of this new emerging industry on both fronts and provides significant economic opportunity, as Canadian firms are leading funding of this industry worldwide,” said Aras Azadian, CEO of the Canadian cannabidiol biotech Avicanna. Canadian biotechs and medical institutions are poised to lead medical and intellectual property development for cannabinoids, which represents a long-term economic development opportunity, Azadian said. Estimates from the Canadian Imperial Bank of Commerce indicate the legal cannabis market will be worth $6.5 billion by 2020. 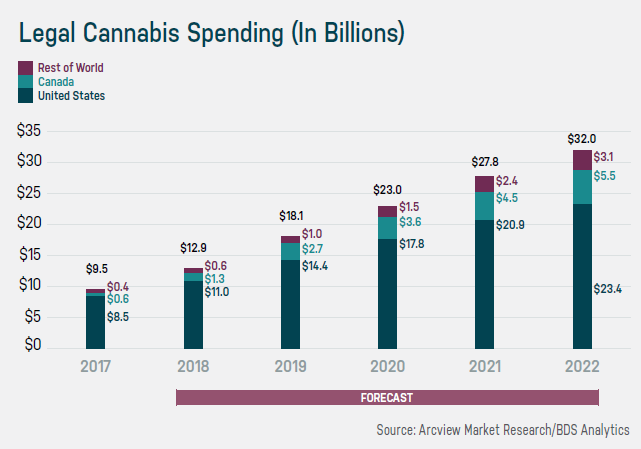 On a longer time horizon, New Frontier Data projects the domestic legal cannabis market will reach $6 billion by 2025, up from $1.3 billion in 2018. If the legal cannabis indeed reaches $6.5 billion by 2020, it would outpace Canadian spending on alcohol, Siegel said. Beth Stavola, COO and president of U.S. Operations at MPX Bioceutical Corp MPXEF 2.63%, seems to agree. Green Chip Stocks’ Siegel expects countries such as the U.S. and Mexico to follow suit with legalization in the next 10 years. “The value of the Canadian market is likely going to be much higher today than it will be in 10 years, when exports won’t be paramount to the viability of non-Canadian markets and capital will be able to flow into markets outside of Canada. At some point, the Canadian cannabis market will reach a plateau and level out. But in the meantime, the value of the Canadian cannabis market today should not be trivialized. This is an incredibly lucrative market,” he said. Arcview Market Research and BDS Analytics are optimistic as well. 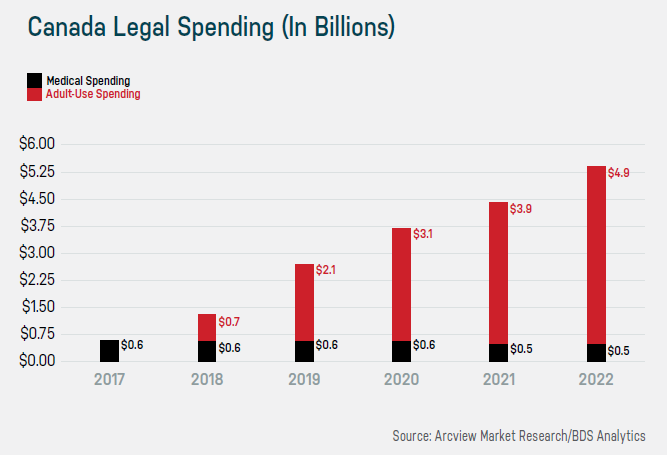 In their latest “State of Legal Marijuana Markets” report, the firms estimate sales of $5.4 billion by 2022, with Canada capturing 17 percent of total global legal consumption. “The significance of Canada paving the way for major western economies is difficult to overstate,” said Tom Adams, BDS Analytics’ managing director of industry intelligence. The six U.S. states with functional adult-use cannabis markets point to shrinking illicit sales and teenage use, he said.